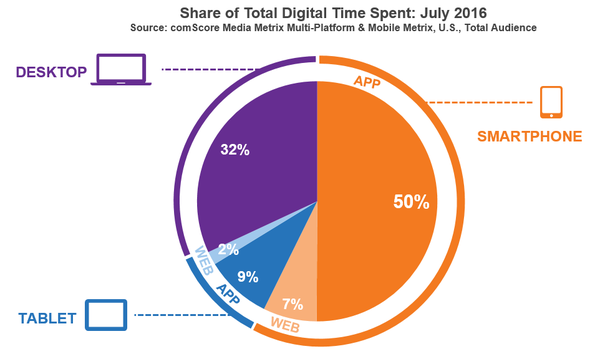 Mobile Apps Take Over Web In 2016. Google in a spot of bother? The mobile era is here and bigger then ever. Today, the number of mobile users is much greater than the previous years. The relentless movement of mobile apps is engaging more and more mobile users forcing them to spend a lot of time on their mobile apps. According to estimates, users spend 86% of their mobile time on mobile apps out of which 68% of the users engage with brands through apps. According to new data from ComScore, more than half of all time Americans spend online is spent in apps. This has increased 41% as compared to last two years. The rise of mobile app users has urged the companies to make apps that can engage their audience more effectively. This might not be a good news for companies whose business is built around open web. Google was built with the idea of free and easy accessibility to information but closed-off apps are making it harder to search and link to content. Although Google is making the internal content of apps searchable but it is not sure whether it will be able to dominate app search in the same pattern as it did for web search. 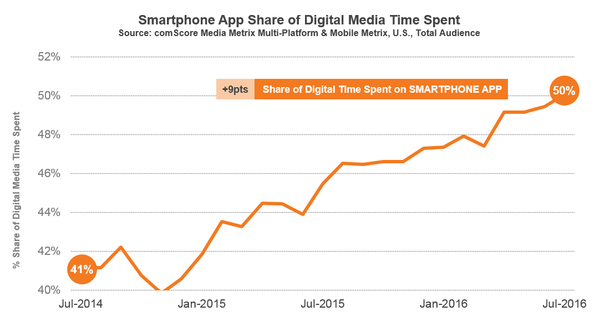 Mobile apps are become increasingly popular for accessing information and that is shown in the graphs from ComScore. This helps to explain how mobile apps are taking over the search platforms. The below given graph demonstrates how the time spend by people on mobile apps has risen sharply over a short period of time. 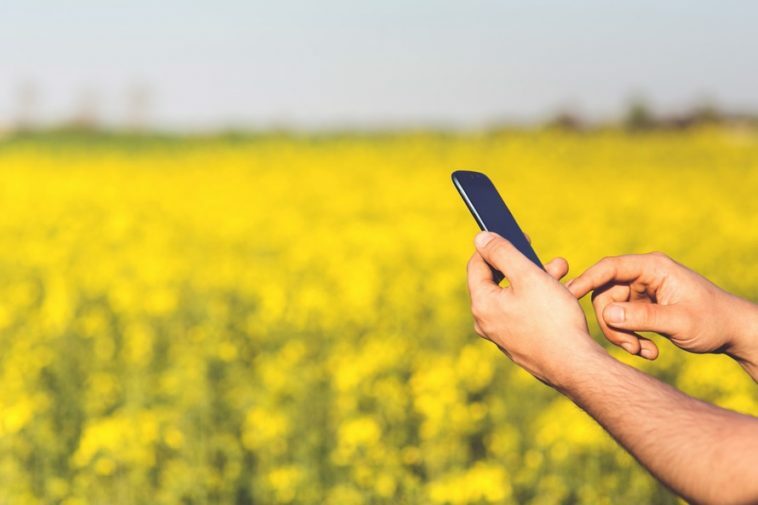 Mobile apps have made it much easier for companies to stay connected with their customers. In fact these apps have become essential for organizations and companies to compete successfully in the market. There are many reasons for mobile apps to be preferred over the mobile websites. With mobile apps, organizations and companies are better able to engage their audience; it gives them more of a personalized experience. Apps are purpose-focused which gives a big reason to the user to immerse completely with their devices. Brands on the other hand also strengthen their trust in the user’s perception especially when it comes to external customer-facing apps. Mobile apps provide additional features to its users such as push notifications, address books, audio recording, device vibration, cloud integration, offline access, and caching. Also mobile apps offer high levels of security; these can simply incorporate with the existing security systems. By using Mobile Device Management Software (MDMS), Apps can lock down or retract and provide greater control over the mobile devices. Apps strict security standards are considered more secure as compared to the typical websites. Mobile apps have various internal as well as external uses. The internal uses of the apps involve the biggest benefit of communication between employees which makes training as well as access to resources much easier. The ability of apps to provide instant support and information to customers when required is the most significant advantage in the form of external uses. Mobile apps provide an instant access to information offline and online which make it easier for the customers to find the information they want. Along with all the benefits, the most advantageous is that apps help to generate additional sources of revenue. They help the companies by providing them extra sources of revenue but also aid them in making a name for themselves. The mobile websites on the other hand are not much rampant when it comes to mobile behavior of the customers. The features they offer are limited to access making the process a bit complicated. The security of the mobile websites is secure but the websites have no control over the mobile devices. With all the benefits of the mobile apps, the mobile websites do face some challenges but their advantages cannot be ignored. The best way is to combine the mobile apps and websites to get better results. Previous article We are graduating students every year. Do we have job for them? Next article World’s Most Expensive Domain Names.